Countryside lover Venetia Phipps has taken the byproduct of one of Britain’s most quintessential sports and turned them into a creative crowd-pleaser. Kate Chapman finds out more. 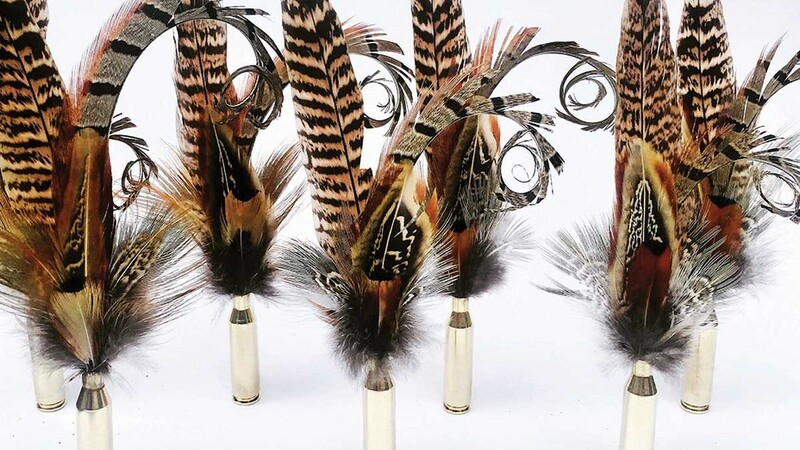 Concerned about what would happen to all the feathers left over after a game shoot, Venetia Phipps used her creativity to transform them into a stunning wreath creations and now runs her own business dedicated to the effort. Venetia, who launched Plucking Fabulous in 2014, is finding her designs are popular alternatives to more traditional Christmas decor and are also being used as centrepieces and decorations at balls, weddings, shoot suppers and other events. She came up with idea of using the plumes of pheasant, grouse, French partridge and other game birds – which otherwise would have gone to waste – after seeing other feather crafts at a London fair. Following on from some online research Venetia, a corporate lawyer at the Cambridge offices of Howes Percival, made a wreath for herself and then others for family and friends and soon found herself inundated with requests for her work. A keen shot herself, Venetia was properly introduced to the sport by her boyfriend, Essex arable farmer Robert Tubby and it was during a shoot on his farm she questioned what happened to the left over feathers. “I discovered the birds go off to the game dealer for processing for food, and their feathers get burnt. “I just asked because they are so beautiful, I thought they would be used to fill pillows and cushions so for them to be burnt seemed such a waste of a beautiful, natural product,” she recalls. “My sister was getting married so I thought I’d be able to use them creatively some way, but in the bag I got back from the game dealer they were all torn, stripped and rough. The machine literally strips them off the bird and I couldn’t do anything with them. “Rob had plucked birds before so he taught me, and I had a go myself and I ended up with all these beautiful feathers. 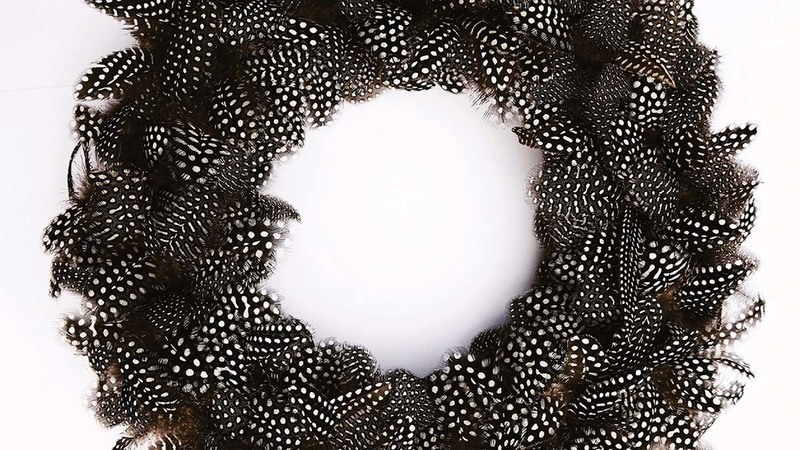 “I’d seen some pheasant feathers in a traditional fir wreath at a Christmas fair in London and that’s when I had the idea of making one completely out of feathers. “Some of these plumes have the most unusual, stunning designs. French partridge are very feminine and when you look at a pheasant you’ve got the green feathers, then ring neck feathers and coming down the breast you get the blues and blacks underneath. It took Venetia 13 hours to make her first wreath; she initially used glue, but found it to be too sticky and messy. After more online research, where she discovered feather wreaths are hugely popular in America during autumn, she began to play about with other ideas and started sharing her creations on social media. After reverting to a foam base she has managed to get production time down by a considerable amount, although each piece is still painstakingly handmade. She’s learned to sort her feathers along the way too, as this cuts down the time it takes searching out each one she needs. She launched Plucking Fabulous four years ago and got a website which links to her social media accounts Instagram, Twitter and Facebook. Venetia’s wreaths come in a variety of sizes ranging from 10-20 inches in diameter, with prices starting from £49.99. She’s open to bespoke commissions and has even made a giant wreath measuring two-metres across. Her collection is versatile and unlike holly, fern and other wreaths, can be kept up all year round and hung on walls, laid on tables or as other centrepieces. More recently Venetia has started hiring out her creations for events after being approached by the organisers of a countryside ball. “They initially contacted me asking if I would donate a raffle prize. I asked if they’d thought of doing centrepieces but they couldn’t afford to buy 20, so I suggested hiring them and then returning them,” she explains. “It worked out cost-effective for them and I actually sold four that night to people on the tables who really loved them. As her business has grown she has continued to add new products to her portfolio including heart-shaped wreaths, which are apt for wedding, valentine and engagement gifts plus button holes and hat pins. And after being gifted a large quantity of peacock feathers she’s also created a number of limited edition wreaths made of these too. Another recent addition is feather covered numbers and letters, which can be bought individually as initials, or to spell out words such as NOEL, HOME and LOVE. “I noticed one or two other people were starting to make similar items, so I needed to come up with something that nobody else was doing,” she says. “It was branching out into events and weddings that got me thinking about doing a Mr & Mrs – so that set me off making my first letters, and then I though now I’ve got to do numbers too. “I’m continually trying to grow the business – the first year I only made 30 wreaths, the second year I did 100, last year I made 300 and this year I’m aiming for 500. As for the future, Venetia is keen to continue expanding Plucking Fabulous but even she admits there are only so many hours in the day. “At the moment it’s still just me making them all by hand – although I have developed my technique, so I’ve got quicker and can also make them fuller and thicker. And my Mum helps to parcel orders up and take them to the post office. “I get 25 days annual leave from my day job, I use 24 of them, plus every evening and every weekend making more stock, but having that commercial background, corporate understanding and good knowledge of the law – it’s my job to advise businesses - means I can operate my own business quite well. “I want to keep going, so in the future I might consider taking someone else on in a creative role.